The set of “Morning Joe” offered a startling admission Monday, telling viewers that not only was Trump aware his attacks on critics were often racism, but that he admitted as much to the in private in the past. Fellow co-host Joe Scarborough offered a pointed eyebrow raise and seemed a bit taken aback by the disclosure. He didn’t confirm or deny the incident on-air. “We’ll see if it works tomorrow. I’m not so sure it will,” he said before the pair moved on. With election day around the corner, Trump’s closing argument has mostly focused on immigration fears, like a caravan of illegal migrants coming from Mexico, which critics have accused of being racist dog whistles. Reps for the pair at MSNBC declined to comment or offer any additional details. 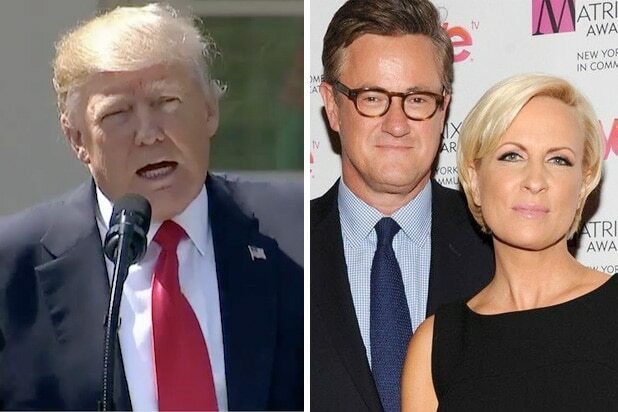 Both Joe and Mika were known to be chummy with Trump before he became president and the show has taken heat in the past for it’s softball treatment of the billionaire in 2015. President Trump has long been accused by critics of lobbing racist attacks against his opponents, something his defenders have been forced to deny (with varying degrees of forcefulness) over the years. The president’s first major foray into racially charged politics came during the second term of Barack Obama, when the real estate billionaire spent years asserting that his predecessor had actually been born in Kenya and was thus not a legitimate U.S. president. The conspiracy — known as birtherism — received a willing and receptive audience on Fox News, where Trump began making regular appearances on the network’s morning show “Fox & Friends.” In the years he spent calling into the show, he rarely faced pushback from hosts Steve Doocy, Brian Kilmeade and Ainsley Earhardt. His relationship with the program and its hosts has only become tighter since his move to the White House.